Tooth sensitivity is tooth pain due to a wearing away of the tooth's surface or gum tissue. 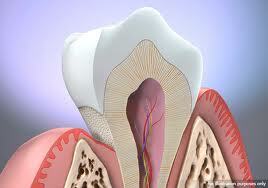 The most common cause of sensitive teeth in adults is exposed tooth roots due to receding gums. Because these roots are not covered by enamel, thousands of tiny channels leading to the tooth's nerve centre (pulp) are exposed. When heat, cold or pressure touches these channels, you feel pain. First and foremost, tell your dentist. Sensitive teeth can usually be treated successfully. Your dentist may prescribe a brush-on fluoride gel or a fluoride rinse. You can also try low-abrasion toothpastes with formulations made especially for sensitive teeth. Ask your dentist which anti-sensitivity products are right for you. Be careful to brush properly or you can cause your teeth to wear away, making them sensitive. Over zealous brushing, the clasp of a partial denture and braces can also lead to abrasion (loss of tooth surface).